I was working for an ISP at the time and was fortunate enough to be responsible for customer hosted services. This was 2004, way before private cloud and back then it was all about managed services. I first got my hands on VMware GSX, then soon after started tinkering with ESX. By 2007 I had my first VCP and was piloting VDM 2.0 beta (now Horizon / View). When I first joined VMware in 2011 there were already a few VCDXs working in the professional services team. For me it was a goal to becoming a consulting architect, but also a personal endeavour to prove my abilities to myself. Without drawing comparisons to post-grad education (because it’s not) it did present a challenge over the longer term, rather than study then take an exam. I took my time. Although I already had a few designs under my belt, I wanted to approach a customer design engagement with VCDX in mind from the start. That particular customer project lasted 12 months so I was able to go through all of the design phases (discovery, assessment, plan & design, build & test, etc.) and put emphasis on each phase. Firstly don’t try and rush it. Really. Spend as much time as you need on the design, and make sure you read the blueprint! It may seem obvious, but I have seen designs that completely miss some parts of the blueprint out. Also you may need to dust off an old design. This is ok, but try and update it even if you have to introduce some fictitious elements. The next biggest tip is to avoid just filling in a design template. VMware partners and professional services have access to delivery kits and design templates. Feel free to use them but remove all of the sample content and use your own material. The secret formula? Set yourself a high standard of documentation and clearly articulate the design, mapping the customer requirements to each design decision you make. I wouldn’t change anything. After all I managed to pass first time so I must have done something right. However, looking back on my design now is eye opening. The journey doesn’t end once you achieve VCDX. I can pick so many flaws with my original design now I look back at it. That said, the VCDX process doesn’t look for the ‘perfect’ design and I remember putting in over 100% so that is what matters. Yes it was worth it. In fact I had just transitioned to a new role within VMware while waiting for the results. Everyone in my new team knew I had just finished the defence panel so there was a lot of pressure to succeed. Until someone goes through the process themselves I don’t think many people realize how difficult it can be. 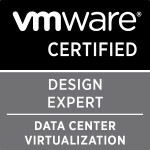 Since getting my second VCDX (Desktop), customers often ask for me by name which does wonders for my reputation within VMware. It also allows me to work on some very exciting projects which means I get to work with some big names in the industry.